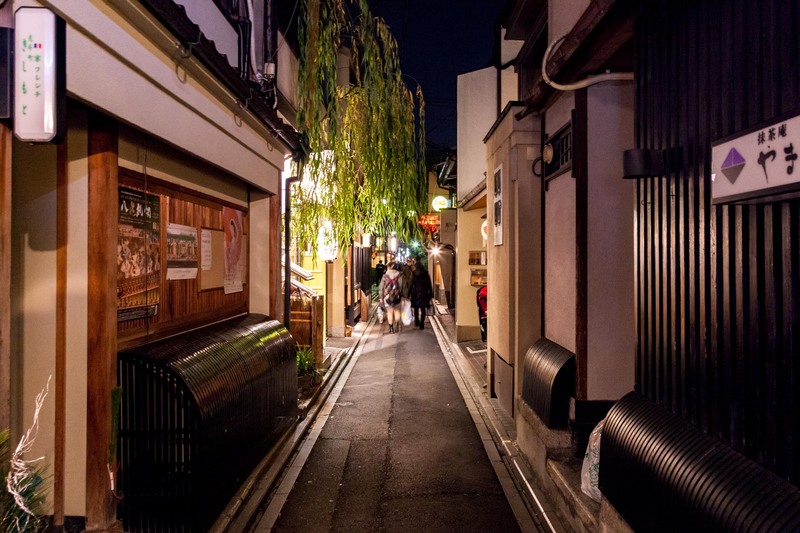 As one of the most night atmospheric spots in Kyoto, Potoncho is widely considered as the most beautiful street by almost all Kyoto locals and even tourists coming here. Holding the original pensive expression in every single details, nobody knows since when Potoncho became one of Japan’s oldest surviving nightlife areas. 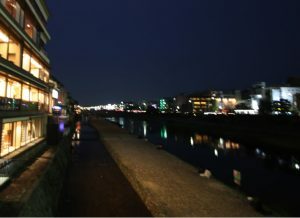 It is fact that, the street once used to be a red light district of Kyoto, if you know what we mean. This figure seems to be remain inside the looming light floating from yellow street lamps in some corners of Potoncho. At that time, the street was known for the exclusive business with high prices that they only accepted reservations from individuals of reputation. You want to use a dinner at Potoncho, you have to call first and certainly, by Japanese. No matter anything has changed, Potoncho keeps immovable or, just shifting slowly, in the field of style. That is why you often hear the advice which you better take a local tourist guide or a local friend to come to Potoncho with you. It is not about how much money you have or how much enthusiasm you get. 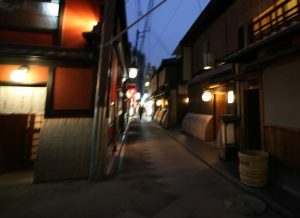 It is a story of the unusual way to approach this special street of Kyoto. Basically, Potoncho is one among two narrow street of the district. The other one is wider and specialized by popular cafes, bars, pubs and restaurants with dazzling neon light. Potoncho is a kind of more narrow than the sister, a pretty stone paved alley running parallel with the west bank of Kamogawa river connecting Sanjo and Shijo over the length of about 6 city blocks. No cars, no modern establishments or flashy billboards, Potoncho is home for tea houses along with geisha entertainment, traditional bars, cafes, shops and restaurants offering various choices of dining from cheap to expensive, traditional to modern, Kyoto to foreign cuisine and even highly exclusive dinner. Quite normal in day light, Potoncho alley will be completely different during the evening and night with almost all restaurants and shops along the alley overlooking the river, swaying lightly their lanterns out over the alley, one by one dropping down to the stream. In summer, visitors can have dinner on the wooden platforms installed over the water, fighting the summer heat by the cool steam and breezes from the river bed. 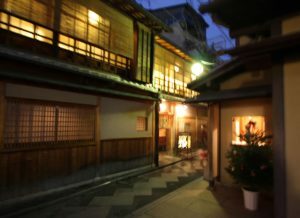 Known as Kawayaka, this form of enjoying Kyoto cuisine is unique at Potoncho alley. An other speciality of Potoncho is geisha, just in a form of maiko or geiko groups that can be caught at the southern end of the alley. You can not only enjoy their magnificent dance in rythmical music inside cafes but also arrange a ate with them at some clubs scattering along Potoncho street. Restaurants, bars and shops usually open from 5:00 pm to 11:00 pm. Some also open for lunch. Take a 10 minute walk from Higashiyama Station. Take Kyoto city bus No.17 or 205 from Kyoto station then get off at Shijo Kawaramachi. The view is very nice. Day time or night time. The food price of course is for high class. You can enjoy the surrounding area like malls, river and even the busker will entertain you. This is a must place to visit in Kyoto, especially at night. We loved the shops, the narrow alley, and as a bonus we got to see a real Geisha! From Takoyaki to sake bars this area has it all! Be aware of the cover charges for most places. There are some cheap eats and very expensive ones too. Our favorite spot was just off the alley called the Sake Bar. The red light. A gigolo was offering me companionship 😂 kidding aside, the food selection is great!